If you are a nursing mom and haven't heard of Undercover Mama, then you are going to have to really listen up today and read this review because I am featuring one of the greatest products for nursing mamas out there! When I first started nursing with my first child, there were two things that drove me crazy and made nursing very frustrating: 1) Finding clothes that were both comfortable and allowed me to nurse in 2) Not exposing my skin, sides and stomach when nursing, especially right after giving birth! Undercover Mama has come up with a great solution with their undershirts and they are constructed of quality material and are made to last. Your Undercover won't bunch up, slide around, or ball up after washing. They fit where you need them to while keeping you covered in style. The generous length allows you to tuck it in or go for a layered look. You attach Undercover Mama shirts to the outer flap of a top-opening nursing bra by sliding each hook onto the flap a little below the clasp. Usually it will slide on just below the seam where the bottom of the clasp is sewn to the bra. You want to push enough material into the hook so it is snug. On most bras you can slide the hook clear on so that the entire width is inside the hook, but even if the strap is too wide to fit completely in, it still works just fine. You can also slip the hook of the Undercover Mama on to the strap of your bra instead of the flap. Keep in mind with this option you will need to unhook the Undercover Mama each time you nurse. They have expanded their line and they now offer a Lace Trim Undercover Mama and I am IN LOVE WITH IT! Not only is it super functional, but it is super cute and fashionable! I love wearing it layered under my shirts and the lace bottom is so feminine! 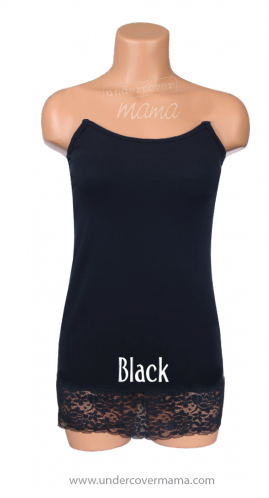 I chose the Lace Trim tank in Black and I love how versatile it is and how it is a great fit under all my shirts! The longer length stays put and the lace really adds a special touch to all my outfits! The clasps are easy to attach to all types of bras and I wear my Undercover Mama while pregnant, nursing, and when neither! It is now an essential in my wardrobe and I don't know how I lived without it!! Sadly, the LACE TRIM IS A LIMITED STYLE so get it while SUPPLIES LAST! Buy It: You can purchase the Lace Trim tank for $26.99 from Undercover Mama. Win It: Undercover Mama is generously offering (1) Undercover Mama tank in winner's choice of size and color to a lucky winner!